Robin Lee Hatcher is a well-known, popular author of Christian fiction. 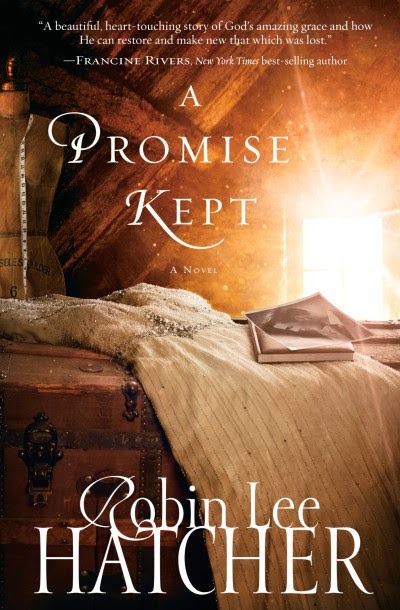 A Promise Kept is an extraordinary book because it tells Hatcher’s personal story. She and her husband were divorced because of her husband’s alcoholism. God restored this marriage and Hatcher used her protagonist Allison, to tell this story. The book is also unusual in that it seamlessly switches between two women. Allison’s story, set in contemporary times is juxtaposed with Allison’s great-aunt, Emma, set in the 1920’s and 30’s. Both of the narratives of these two women gripped me, so much so that I forgot about the winter weather going on outside. Hatcher skillfully explored themes of betrayal and loss. But she also described redemption and healing. I loved Emma’ story – the story of growing up with a beautiful sister who had boyfriends galore, while she “faded into the wallpaper.” Emma did get married but she had a loveless marriage with an unfaithful husband. She finally found independence and freedom. Allison’s story was uplifting. It shows the journey from bitterness and avoiding God to a strong, forgiving woman, transformed by the grace of God. Her story reminded me of how God’s time is often so different from our time. Allison “waited on the Lord” and her marriage was healed. I actually hated being done with this book. I wanted to spend another year in King’s Meadow, Idaho – the setting for the story. The descriptions of the beautiful surroundings were inspiring – even the parts about the snowy winter. I longed to be a part of Allison’s new church community and the story of her growing friendship with Susan was lovely. I also enjoyed Emma’s beautiful sister, Elizabeth. The story showed “Liza” had more than just a beautiful face.